Street Baseball was a brand of playing baseball in the streets of the hood which took no prisoners. The skills of playing were tempered with raw toughness and bravado not found on most or many of the other more structured and friendly baseball playing fields. Some of baseballs Hall Of Fame greats earned their spurs, in a manner of speaking, in the streets. Yogi Berra knew the street as a ball playing mecca. His first hard disappointment came when by fate of baseball playground rules made him "wait his turn" while his buddy from the streets of St Louis Joe Garagiola was picked from the streets of St. Louis and signed with the St. Louis Cardinals. Yogi by fate (or if you will in the rules of life) was destined to be one of the most loved of the Bronx bombers of our fabled and leading world champion teams the fabulous seeming perennial winning New York Yankees. My capability to speak from on site experience is limited. The stories and movies depicting play on the streets of New York and San Fransisco provides adequately the portrayal of this play. In the deep south our street baseball rules were more subdued and with less traffic to contend. There was toughness associated with a street playing style of, "take no quarter", you were expected to be tough. In most games of street baseball rules the game was often modified and a version of Corkball took on a life of its own. Street baseball rules was so prevalent on the streets of New York one of the all time greats Willie "Say Hey" Mays was often caught joining the youngsters there. Willie Mays our Baseball Hall Of Fame great player playing with the then New York Giants. The Giants and Willie moved on west and settled in San Francisco the city by the Bay and the place where Tony Bennett "Left His Heart" high on a hill. Corkball was popular in the streets and replaced street baseball in the urban living places other limited space areas, where windows were an ever present deterrent from using a baseball. Cork use was simply what it was. Did I get a surprise when I recently received an email about Corkball via my Baseballfarming website. Corkball has been alive and well through the years in some parts of the country and folks you too now have a chance to join the Corkball playing action. The cork was nothing standard when the game was played here in the South. Whatever size cork that anyone had is what we used. 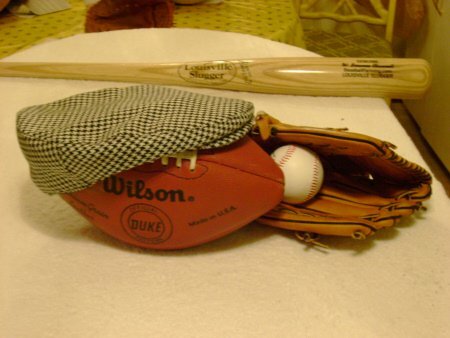 Buster I did not during my corkball playing time at the boys dormitory at Alabama Polytechnic Institute (API) realize it had life and was an organized play with a standard official Corkball and Bat with St Louis being the center of attention and the Corkball hotbed capitol of the Country. Just chalk it up as this lad growing up without a lot of travel and experience of the world around me. All that is not of importance the only thing we knew back then was that we played our game and St.Louis apparently played their game. Boys who lived in families that enjoyed fishing normally had access to many corks and of sundry sizes. Many times we had use of a round red and white colored cork. These round corks were prizes for the most common cylinder shaped corks, small on one end and larger on the other end, were real doozies to hit. For the corkball bat, eureka, it was usually moms broken broom handle. Many a mom never knew how her good broom lost a handle. She would see the games in progress but being the good mom she was, she never complained about her broken broom handle. She knew. We simply thought we were sneaky slick. The most cork ball that I personally ever played was inside the inner courtyard of what was once Auburn's Magnolia Hall. Magnolia Hall was the main boys dormitory during the 50's on the Loveliest Village On The Plains, Auburn University, Auburn, Alabama. Bill Sparks, Ronnie Syphers, Ross Wommack and Rip Riggins, were corkball playing whammer jammers. Now the folks at Midfield High School probably never knew their coach was the corkball hitting champion of Magnolia Hall. The only person that I knew who could hit better than Bill Sparks was Ross Wommack (he was a hitter too). The only time I remember observing a successful cross handed hitter was in cork ball. His name has completely slipped my mind. It has been several years. My Dad also would bat cross handed. The corkball hitter would make me think of how Dad would hold the bat. Dad told me he used the cross hand to hold the bat because when he was young and helped Grandad clearing land to cultivate, he swung an axe that way. My Dad was not a ball player so he did not cotton to street baseball, however he truly enjoyed the games of baseball and football, but his lot of being a country farmers son he had precious little time for ball playing. He did raise up six boys and two girls. The girls played some but all of us boys were given the time to enjoy playing ball. He started a family just as the depression was upon our land. His time was taken with making a living for us youngsters to enjoy baseball and other sports which he had missed. Being from the country and rural America my dad never had the exposure of playing baseball by street baseball rules. Baseball players from all walks of life learned to love the game and how to play from all the playing diamonds or from any corner even in the streets by Street Baseball Rules. Street Baseball was baseball playing by the baseball playground rules. Free time, Let's go play a game! Return to as you leave street baseball rules BaseballFarming Home Page our baseball home page which is an introduction to the concept of baseballfarming and includes ideas on strategies, training, and winning.